Lai H, Wu K, Wang N, Wu W, Zou X, Ma X, Wu P (2018). Relationship between volatile organic compounds released and growth of Cunninghamia lanceolata roots under low-phosphorus conditions. iForest 11: 713-720. To understand whether Chinese fir (Cunninghamia lanceolata) can conserve energy by reducing root volatiles to maintain growth under low phosphorus (P) conditions, we cultivated two half-sib families of Chinese fir that display high and low P use efficiency under conditions of normal P supply and total P deficiency. Gas chromatography-mass spectrometry analysis was used to determine the content of root volatiles, and the relationships among root volatiles and root growth index, P content, and distribution were analyzed. There were significantly fewer volatile organic compounds (VOCs) in the rhizosphere of these two fir families, No. 25 and No. 32, under P deficiency. Low P supply significantly promoted root growth in No. 25, increasing both average diameter and volume. A negative correlation was found between the volatiles and the increment of root average diameter and surface area. The belowground P distribution and the root to shoot P concentration (Pr/Ps) were higher in No. 25 than in No. 32. The total amount of VOCs, as well as the amount of 18 individual volatiles were positively correlated with P accumulation, aboveground P distribution, and belowground P distribution, but the opposite pattern was seen in Pr/Ps for family No. 25 seedlings. We conclude that the content and types of VOCs differ among the Chinese fir genotypes. 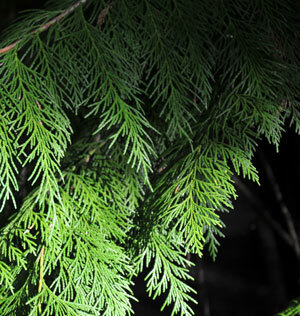 Under low-P stress, the roots of Chinese fir reduce the release of VOCs to maintain seedling growth. Ethylene regulates Arabidopsis development via the modulation of DELLA protein growth repressor function. Plant and Cell 15: 2816-2825. On-line screening of soil VOCs exchange responses to moisture, temperature and root presence. Plant and Soil 291: 249-261. Jasmonic acid-induced volatiles of Brassica oleracea attract parasitoids: effects of time and dose, and comparison with induction by herbivores. Journal of Experimental Botany 60: 2575-2587. Spatial distribution and phenotypic variation in root cortical aerenchyma of maize (Zea mays L). Plant and Soil 367: 263-274. Phosphatase activity and P fractions in soils of an 18-year old Chinese fir (Cunninghamia lanceolata) plantation. Forest Ecology and Management 178: 301-310. Effect of neighboring competition on photosynthetic characteristics and biomass allocation of Chinese fir seedlings under low phosphorus stress. Chinese Journal of Plant Ecology 40 (2): 177-186. Signaling network in sensing phosphate availability in plants. Annual Review of Plant Biology 62: 185-206. Identification of biologically relevant compounds in aboveground and belowground induced volatile blends. Journal of Chemical Ecology 36: 1006-1016. Arguments for and against self and non-self root recognition in plants. Frontiers in Plant Science 5: 1-7. Plant volatiles: recent advances and future perspectives. Critical Reviews in Plant Sciences 25: 417-440. Identification of volatile compounds released by roots of an invasive plant, bitoubush (Chrysanthemoides monilifera spp. rotundata), and their inhibition of native seedling growth. Biological Invasions 11: 275-287. Say it with flowers: flowering acceleration by root communication. Plant Signal and Behavior 9 (3): e28258. Physiological roles for aerenchyma in phosphorus-stressed roots. Functional Plant Biology 30: 493-506. Isoprene emission and primary metabolism in Phragmites australis grown under different phosphorus levels. Plant Biology 10 (1): 38-43. Nutrient uptake, allocation and biochemical changes in two Chinese fir cuttings under heterogeneous phosphorus supply. iForest - Biogeosciences and Forestry 11: 411-417. Priming defense genes and metabolites in hybrid poplar by the green leaf volatile cis-3-hexenyl acetate. New Phytologist 180: 722-734. Localized supply of phosphorus induces root morphological and architectural changes of rice in split and stratified soil cultures. Plant and Soil 248: 247-256. Differential responses of rice acid phosphatase activities and isoforms to phosphorus deprivation. Journal of Biochemistry and Molecular Biology 36: 597-602. Volatile organic compounds in the roots and rhizosphere of Pinus spp. Soil Biology and Biochemistry 39: 951-960. The role of nutrient efficient crops in modern agriculture. Journal of Crop Production 1: 241-264. Rhizoeconomics: carbon costs of phosphorus acquisition. Plant and Soil 269: 45-56. Root phenes that reduce the metabolic costs of soil exploration: opportunities for 21st century agriculture. Plant Cell and Environment 38: 1-10. Ethylene’s role in phosphate starvation signaling: more than just a root growth regulator. Plant and Cell Physiology 53: 277-286. The effect of phosphorus availability on the carbon economy of contrasting common bean (Phaseolus vulgaris L.) genotypes. Journal of Experimental Botany 52: 329-339. Plant coexistence alters terpene emission and content of Mediterranean species. Phytochemistry 68: 840-852. Biogenic volatile emissions from the soil. Plant Cell and Environment 37: 1866-1891. Ecology of plant volatiles: Taking a plant community perspective. Plant Cell and Environment 37: 1845-1853. Phosphorus nutrition of mycorrhizal trees. Tree Physiology 30: 1129-1139. Herbivore-induced plant volatiles mediate host selection by a root herbivore. New Phytologist 194: 1061-1069. Reduction in root secondary growth as a strategy for phosphorus acquisition. Plant Physiology 176: 691-703. Root morphological plasticity and biomass production of two Chinese fir clones with high phosphorus efficiency under low phosphorus stress. Canadian Journal of Forest Research 41: 228-234. Improvement of phosphorus efficiency in rice on basis of understanding phosphate signaling and homeostasis. Current Opinion in Plant Biology 16: 205-212. Low phosphorus and competition affect Chinese fir cutting growth and root organic acid content: does neighboring root activity aggravate P nutrient deficiency? Journal of Soils and Sediments 17: 2775-2785. Does phosphorus deficiency induce formation of root cortical aerenchyma maintaining growth of Cunninghamia lanceolata? Trees 215 (11): 76. Ethylene is involved in root phosphorus remobilization in rice (Oryza sativa) by regulating cell-wall pectin and enhancing phosphate translocation to shoots. Annals of Botany 118: 645-653. Chinese fir root response to spatial and temporal heterogeneity of phosphorus availability in the soil. Canadian Journal of Forest Research 45: 402-410. Strategies of organic acid production and exudation in response to low-phosphorus stress in Chinese fir genotypes differing in phosphorus-use efficiencies. Trees 32: 897-912.